← Sweet Sorbet Stamp-a-Stack – Stampin’ Up! A Sketched Birthday for Carter – Stampin’ Up! 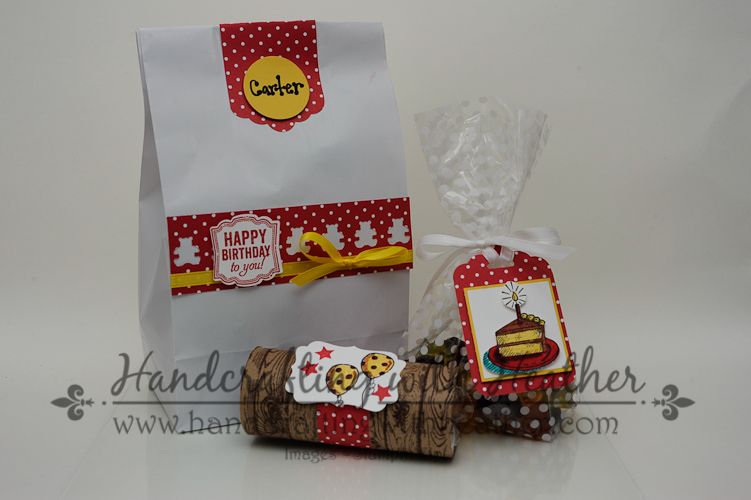 In honor of my son Carter’s third birthday today, I have some party favors embellished using the Sketched Birthday stamp set from Stampin’ Up! (wood mount and clear mount). We are having a small birthday party at the Build-a-Bear Workshop followed by a teddy bear picnic. I bought a red and white checked table cloth, and I wanted to brighten up the table and make it festive with some Stampin’ Up! magic! Next time you entertain, you should definitely consider adding some stamped details to your table. Your guests will be very impressed. If you enjoy today’s project, I would love to hear from you. Please leave me a comment and I will enter you into my drawing. During the month of April, I will be doing a drawing each Sunday. One lucky winner will receive one of the featured products from Sale-a-bration. So, if you missed out on the free items during the sale, now is your chance to win one! Also, if you enjoy reading my posts, why not have them delivered to your inbox automatically. Just click on the “follow” button in the sidebar. I found this tiny teddy bear punch in the back of a drawer (I have no idea when/where I got it from), and I decided it would be a perfect way to embellish the favor bags for the party. A little DSP and the Label Love stamp set… and “voila” you have a cute gift bag for the guests in a matter of minutes! 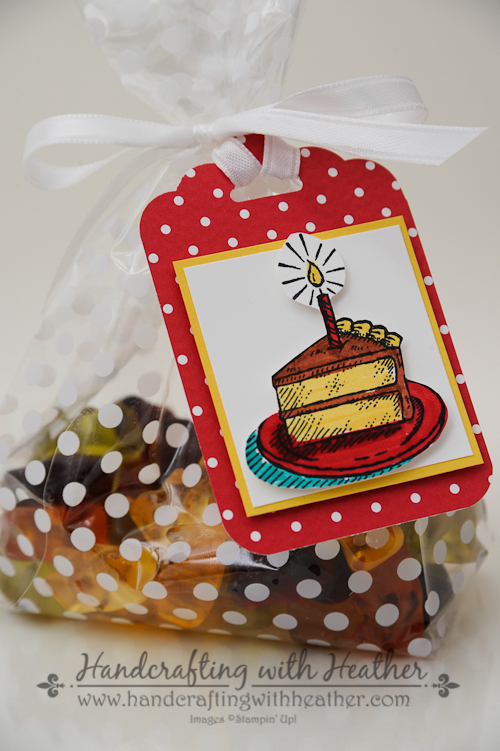 You can’t have a teddy bear picnic without gummy bears, so I decided to use the cute cellophane bags from the Twisty Treats Kit (Sale-a-Bration item), my Scalloped Tag Topper Punch, and the birthday cake stamp from Sketched Birthday to dress them up. Card Stock & DSP: Real Red DSP from the Brights Collection Designer Series Paper Stack (130134) – 2″ x 3″ strip; Daffodil Delight (119683) – 1-3/4″ x 1-7/8″ rectangle; Whisper White (100730) – 1-5/8″ x 1-3/4″ rectangle, one birthday cake stamp. Tools: Envelope Punch Board (133774) – to round the corners of the tag. For this treat holder, I inked up my hardwood stamp with Chocolate Chip ink and rolled a cardboard tube from a toilet paper roll across it. 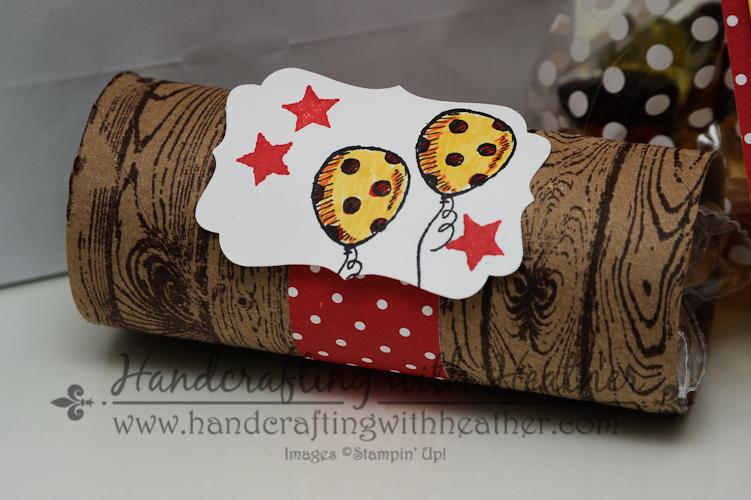 Then I embellished the roll using Real Red Designer Series Paper and the cute balloon stamp from the Sketched Birthday stamp set. Finally, I put some Teddy Grahams in a plastic baggie and placed them inside my “log” decoration. If you enjoyed my post today, please pin it to Pinterest for me. You will find a “pin it” button at the very bottom of the post. Also, don’t forget to leave me a comment for your chance to win a free stamp set from Sale-a-bration! 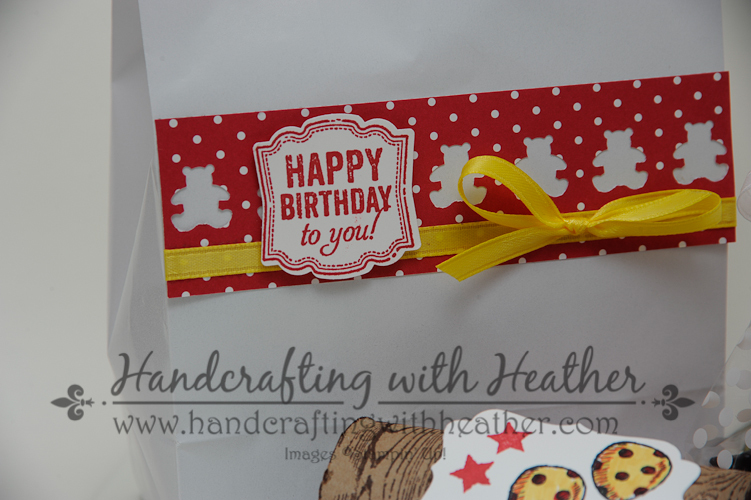 If you are interested in purchasing the Sketched Birthday stamp set from Stampin’ Up! or if you need any other stamping supplies, I would love to be your personal demonstrator. Of course, you can always shop now in my online store! Click here to see the Weekly Deals from Stampin’ Up! in my online store. The Weekly Deals are only while supplies last and only available at these great prices through April 14. These are such creative ideas. I’m very impressed. just adorable–wish I had some littles around to party with…but alas, they grow up! However I’m thinking I could do some cute things for a ladies’ luncheon! Thanks for sharing! !